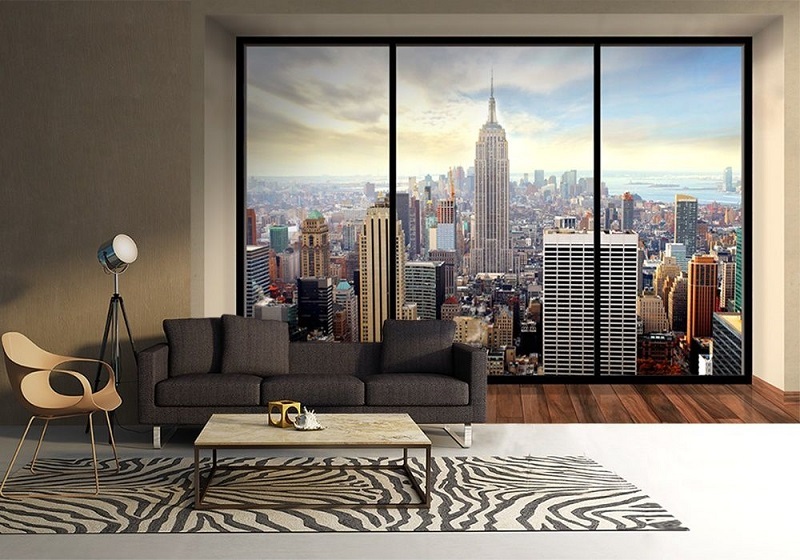 3D wall murals have appeared on the market quite recently, but already managed to gain huge popularity. This type of wall murals is distinguished by its striking ability to imitate wall molding, as well as various types of dimensional wall decorations. In case one wants to decorate modern interior with molding, but has no space or money for it – 3D wall mural will make even better job than the real molding, which can dry up and crumble with time. One can choose from a wide selection of 3D wall mural themes, starting with textures and patterns, for instance – white brick wall, or metal effect surface, to elaborate abstract designs, and even multidimensional effect, when one sees a herd of horses, jumping though a breach in a very authentic-looking brick wall. Wall Murals with 3D effect can make any modern interior exceptional and mesmerizing, becoming the centerpiece of the living room and main attention-grabber for the guests. For small rooms that do not get much sunshine during the day, lovely fresco wall murals will be a perfect choice, especially if the owners of the apartment love seaside scenery. 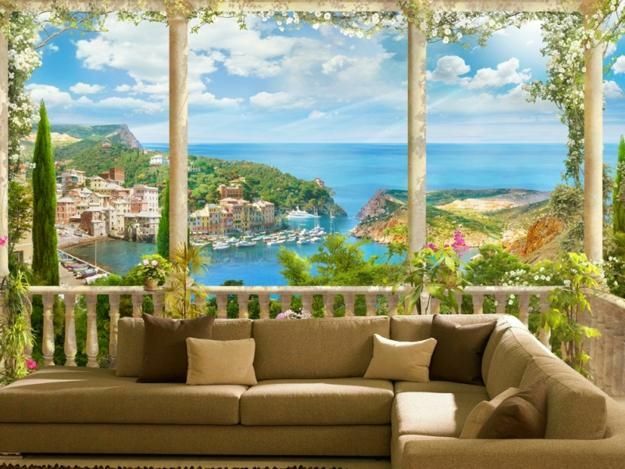 Fresco wall murals add a balcony or porch with seaside view to one’s room. Apart from drastically expanding the room, fresco wall murals bring in light and inspiration. 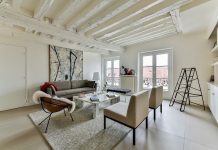 Owners of the apartment, as well as their guests will be immersed in sunny and well-spirited atmosphere of a seaside resort. Looking at fresco wall murals one can almost feel the fresh breeze of air. 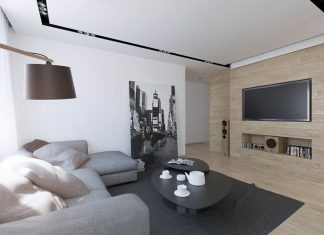 Wall murals of this type can be installed even in the corners of the room in order to create panoramic effect. Apart from serving as a wall decoration on its own, fresco wall mural can be successfully combined with other elements of décor, to create striking effect and harmonize the room. One can add exotic flowers in hanging cachepots or ceramic vases on the coffee table to complete the impression of a real balcony or porch. Space-themed wall murals allow creating extraordinary interiors, mesmerizingly beautiful and captivating. Space-themes wall murals are suitable both for small living spaces and for roomy ones. 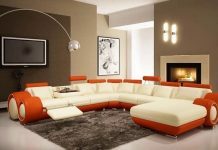 However, if the living room is small it is recommended to accomplish the rest of the interior in light colors in order to create a sharp contrast between the rest of the room and wall mural. Wall murals of this type instantly become the main attraction of the room, drawing attention and admiration of the guests and getting one into philosophic mood. It is rather hard not to think of other worlds’ existence or the purpose of oneself on Earth, seeing the vastness of space and astonishing beauty of galaxy and stars in this wall mural. 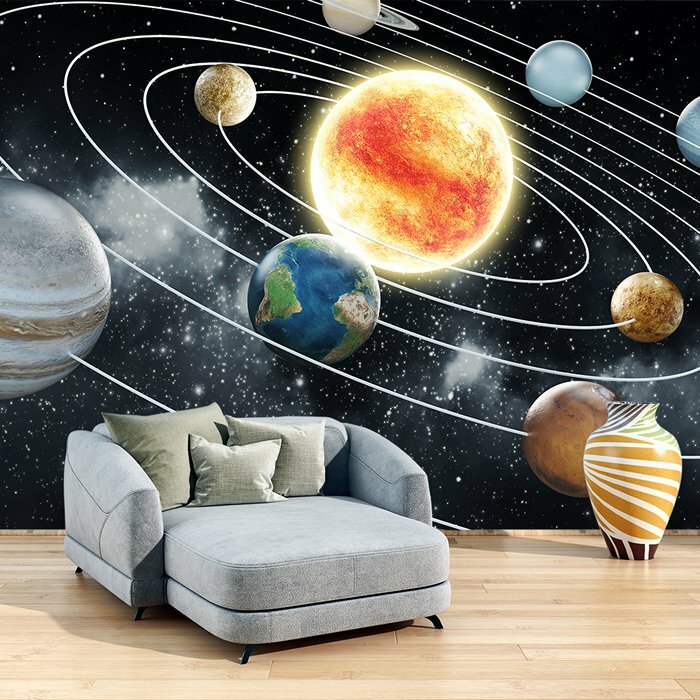 One can select space-themed wall murals with 3D effect, complete with led lights in order to create out of this world experience in their living room, and achieve mind-blowingly beautiful modern interior décor. Apart from the obvious advantages, such as very affordable cost and vast choice of themes and solutions to choose from, wall murals can also be customized. 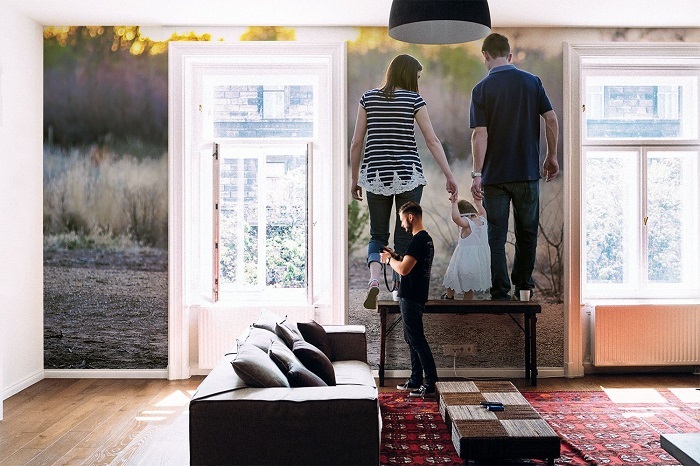 Any photo or digital portrait can be turned into beautiful wall mural. 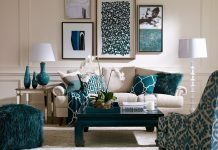 Photos from vacation, wedding collages, photos of pets, and happy moments with children, can be edited and used to decorate the wall of the living room, in order to create soothing, and cheerful atmosphere. Another advantage of wall murals is their water- and damage- resistance. Modern latex printing technology allows manufacturing wall murals that can withstand the negative influence of elements, such as direct sunlight or high humidity, without losing their colors and integrity. Eco-solvent inks, used in wall murals’ printing are eco-friendly and do not cause allergies, which means they are suitable for placing in the living spaces of people, prone to allergies. 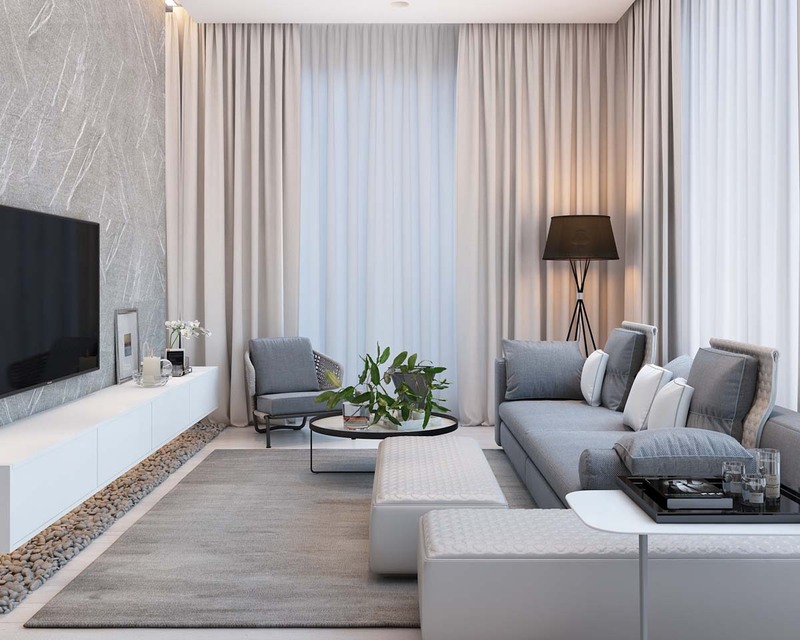 All of these features make wall murals one of the best solutions for modern interior décor that are currently available on the market.